The Subversion support has been implemented as plugin, which is part of the kdebase package and loaded automatically after starting Dolphin. The Subversion plugin has been moved from kdebase to kdesdk. If you are updating to KDE SC 4.5 and don't have installed the kdesdk package, the old Subversion plugin from KDE SC 4.4 will of course still work. However it is recommended to install the kdesdk package to get an updated version. The version control plugins are not enabled by default. Although the loading of the version control plugins is done asynchronously, it still consumes memory and (a little) performance. 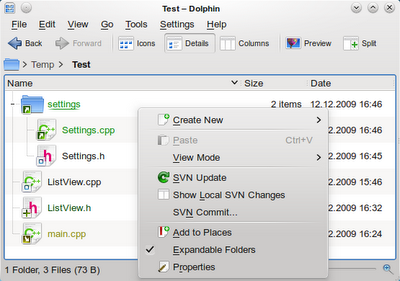 So if you are updating to KDE SC 4.5 and want to have version control support, you must enable the plugins once inside Configure Dolphin... > Services.